Normally I would hit the delete key — or better yet, forward the query to Travelin‘ Joe, just to rile him up. The Top 50 does not recommend golf courses; it ranks them. Sometimes, as with Askernish or Carne, we both rank and recommend a course, but only under exceptional circumstances and with the understanding that we can play there for free. To do otherwise would compromise our integrity. This time, because I’m feeling generous, I’ll waive established policy and create a golf itinerary for our thrifty Argentinian. Let’s start with the fact that Mobile to Pensacola is a journey of roughly 60 miles. Assuming that one has a week to kill and that one’s rental car can achieve speeds of up to 60 miles per hour, I’d start with a round at sixth-ranked Augusta National Golf Club, site of last week’s Masters. But if that is not feasible — either because our impecunious friend doesn’t know a member or because, as happens to be the case, the club has closed for the summer — I can enthusiastically recommend 50th-ranked and almost-as-good Orangeburg Country Club of Orangeburg, S.C.
*Orangeburg is a private club, so you may have difficulty securing a tee time. The guest green fee is apparently negotiable; we paid nothing. Since our route has taken us a bit north and well east of Pensacola, it only makes sense to drive 114 miles further to catch a glimpse of the Atlantic Ocean from Hilton Head Island, S.C. The golf choices here are extensive, topped by the 36 holes at 51st-ranked Palmetto Hall Plantation Club, home club of Dave Henson, our Southeast Region Ratings Coordinator; but we think our penny-pinching Rosarian will get the most bang for his buck* on the 51st-ranked Robert Trent Jones Oceanfront Course at the Palmetto Dunes Oceanfront Resort, voted “2003 Golf Course of the Year” by the South Carolina Golf Course Owners Association. 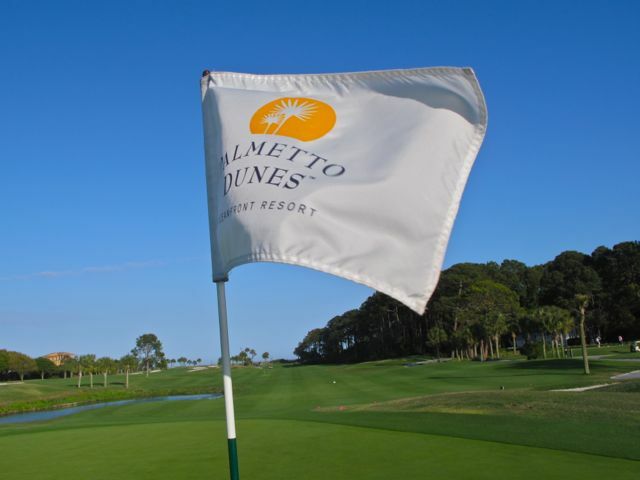 *The April green fee with cart and taxes is $170.33, but our sunburned traveler can play after 2 p.m. for $105.53. (We paid nothing.) 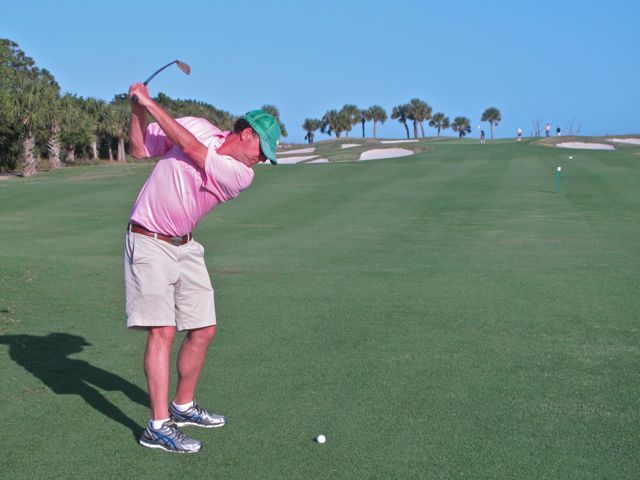 He might also consider the Arthur Hills and George Fazio courses at less than a hundred bucks each, leaving him enough for dinner at the acclaimed Hilton Head Diner. Van Sickle and I played the RTJ course last Tuesday with Sports Illustrated senior writer Michael Bamberger, and we found it to be a fair, fun test with a seafront appeal that puts it in the top rank of American resort courses. “The par-4 seventh was my favorite hole,” said Bamberger, extolling the wood-bulkhead-enhanced grandeur of the lakefront fairway. “I could hit that tee shot over and over again.” Van Sickle swooned over the beachside green complex on the par-5 tenth, which blends white-sand bunkers and tuft-topped palms to unique effect. “I’d like to play this in bad weather,” said Van Sickle, mildly put off by the sunny, 75-degree conditions. Hilton Head is 525 miles from Pensacola, so our weary traveler will want to bunk overnight at the Marriott Hilton Head Resort & Spa, which is a mere drive-and-a-pitch from RTJ’s eighteenth green. I could use a little rest myself, so I’ll complete my Gulf Coast recommendations next time. Top 50 on TV: Nothing this week, but the RBC Heritage is being played 525 miles from Pensacola on Pete Dye’s 52nd-ranked Harbour Town Golf Links. It’s the course with the lighthouse.